Double ocean views, an undiscovered beach, and turtles! (2 bed/2 bath) With two large lanais overlooking Keoni Nu’I Bay, two bedrooms and two full baths, Kahana Sunset E5 is the perfect place to unwind and enjoy Maui. Enjoy the views from your lanai or walk 100 yards to the secluded beach where you’re almost certain to meet one of our resident Hawaiian green sea turtles. Endangered monk seals also sometimes enjoy the quiet sands in front of Kahana Sunset. Next door you’ll find popular Napili Bay (.5 miles north) and Kapalua Bay (1 mile north) and easy access to many other spectacular West Maui snorkel spots and attractions. Refurbished in November 2016, this 1000 square foot condo sleeps up to six adults plus one child (note the minimum age for loft bed is six years old and maximum weight is 150 pounds). The master features a new Westin Heavenly Sleep king sized bed, full bath with an extra-large shower, 42” TV and DVD player, desk area, and large lanai. The second, completely separate bedroom contains a queen bed and custom twin bed loft, full bath with another extra-large shower, and 42” TV. The living room couch can also accommodate guests if needed. With a full kitchen, dishwasher, washer/dryer, and DSL internet, you should find everything you need to enjoy island life – even the convenience of covered parking at your doorstep! Outdoor gas grills offer more spectacular ocean views and unforgettable sunset dining. When the sun goes down, make sure to enjoy the heated pool and children’s pool before drifting off to sleep with the sounds of the ocean lapping outside. 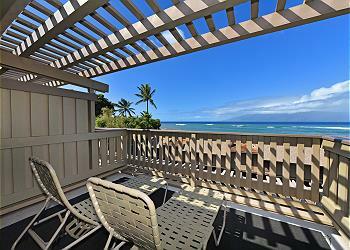 Please come stay at the Kahana Sunset Unit E5, you will want to come back again and again.